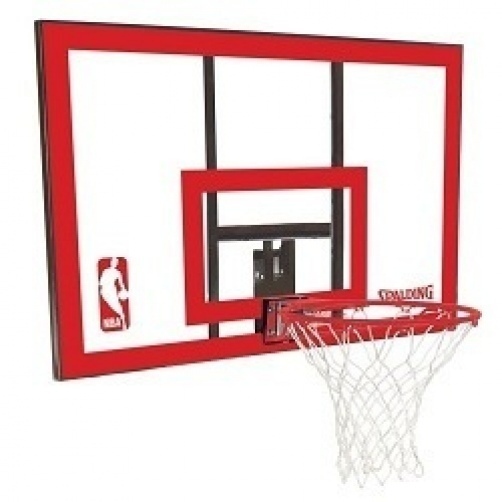 Spalding Basketball Backboards provide an excellent solution when either replacing a current broken backboard or when setting up your court for the first time. The polycarbonate material used on the 79351 provides a better longevity when compared with acrylic backboards. The system also comes with a Slam Jam breakaway rim. As an authorized dealer for Spalding basketball products, we are able to include the manufacturer's warranty. The 79351 comes with a 5-year factory warranty from Spalding. All warranty claims go through Spalding. 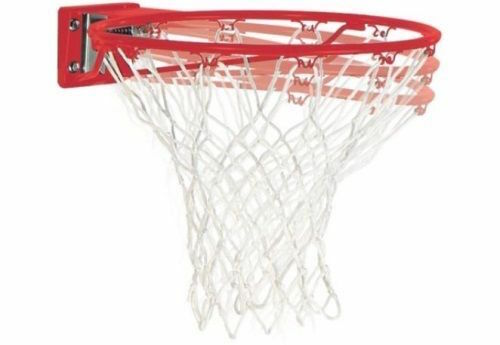 The 79351 is a backboard and rim combo, which includes just a backboard and rim. The mounting bracket and mounting Hardware is not included with this package, but are sold separately. 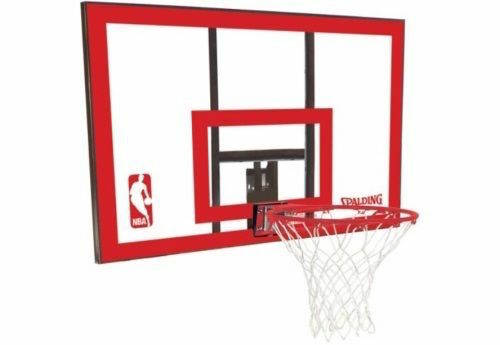 If you are ordering this Spalding basketball backboard as a replacement backboard for your existing system, please contact us first to verify compatibility. Competitive Edge Products is an authorized dealer of Spalding basketball products. 44 inch wide polycarbonate material, with a 1x1 inch frame. Polycarbonate provides a superior strength when compared to acrylic. Comes with a Slam Jam breakaway rim. Rim mounting hole configuration: 2 7/8" x 2 7/8". 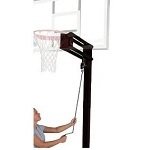 This backboard is designed to mount to a wall or pole using the proper mounting bracket. Compatible mounting brackets are 8406SR, 8839S, 88300s, 316, and 310 (not compatible with any other bracket models). Comes with an all-weather net. Product weight is about 36.82 lbs. Product packaging dimensions: 43.78" x 6.09" x 29.76". This system is shipped via FedEx is most cases. Typically takes 1-2 business days to leave the warehouse and spends 3-5 business days in transit. Q: Is this unit compatible with Huffy/Spalding Portable Basketball System Model 77322T? A: That's a good question, you will want to call 800-558-5234 and they can confirm whether it is compatible. Q: I am replacing an existing backboard who mounting kit is fine, do I need to purchase a mounting kit or can I reuse my existing kit from the broken backboard? A: Most likely you will need to replace the whole bracket, you could call 1-800-558-5234 to see if it would work. Q: Where can I find a Spalding 44" polycarbonate installation manual? A: You would need to contact 800-558-5234. Q: Will this replace the backboard for a portable basketball goal system? A: It can be used as a replacements, but since the attachments vary by model, we recommend that you contact 1-800-558-5234 for compatibility info. Q: I have a Spalding portable adjustable height system (model 77537) and need to know if this backboard can replace my broken backboard, and if possible what might be some other replacement choices? Can I replace with a 48 inch backboard? A: For that you will need to call 1-800-558-5234. Q: I m looking for a backboard replacement for a huffy sports portable system. Do I have to buy the rim and backboard combo. How do I now if it fits my existing system? A: you will want to call 800-558-5234. They will be able to tell you whether this is compatible with your existing system. Q: How thick is the polycarbonate on this backboard? A: The backboard is 2 mm thick. Q: Would this replace a 10 year old NBA Huffy Clear slam backboard? Specifically will the old bracket on that board work with this one? A: Please allow me to refer you to the manufacturer's customer service where they should be able to assist you with this. Here is the contact info: Spalding (formerly Huffy) - tel. 800-558-5234, their website is huffysports.com and their e-mail is service@huffysports.com. Q: Does this backboard fit with the Spalding 537F 44" backboard we bought 2 or 3 years ago at Target? Q: Will this backboard work with lifetimes universal mounting brackets? A: No, it does not work with the lifetime brand brackets. You would need to stick with the Huffy brand/Spalding brand. Spalding and Huffy are one and the same. 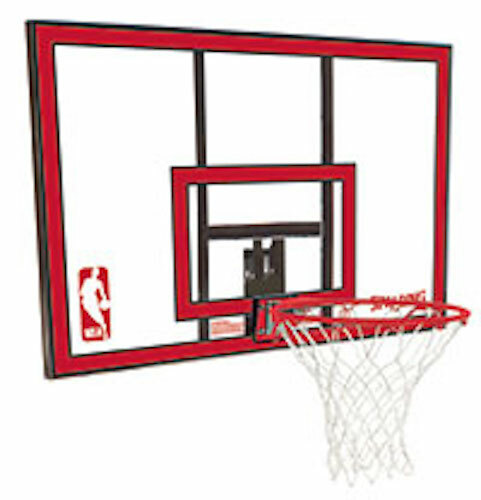 Q: Can I use this backboard as a replacement for my existing Spalding basketball system? A: Spalding backboards are a little tricky to match up with existing systems. Generally, a customer needs to match up the 79351 with a 3.5 inch diameter round pole and either a fixed-height mounting bracket or an adjustable-height bracket that does not use the U-turn mechanism. The mounting bracket is the tricky part because a customer may still have compatibility issues if their basketball system is older (older than 5 years). That said, your best move before ordering this as a replacement backboard is to contact Spalding's customer service at 1-800-558-5234. Q: I see this product listed as a Huffy in some places, and as a Spalding in other places. What is the difference? A: Spalding and Huffy actually refer to the same manufacturer. The 79351 is the same system no matter where you purchase it. You can use Spalding and Huffy interchangeably when describing the 79351 backboard. Q: I have a Lifetime basketball system. Is this backboard compatible with my system? A: No. Manufacturers have specifics bracket designs. While the backboard dimensions might be the same between two different backboards from two different manufacturers, these bracket differences (size, dimensions, mounting hardware, bolt locations, etc.) will differ and make them not compatible with other manufacturers of basketball backboards. Q: What is the different between the 79351 backboard and the E79 backboard? A: There are three differences. 1, the backboard material on the 79351 is polycarbonate; the backboard material on the E79 is acrylic. 2, 79351 has more of a rigid, rectangular shape; the E79 has rounded corners. And 3, the logos and backboard colors will be different. Please note the pictures of each for these differences. Fast Shipping: Orders for the 79351 Combo Kit generally leave the warehouse the next business day. Delivery Details: This product ships directly from Alexander City, Alabama. This item ships via FedEx and may not require a signature. Local Pickup Option: This item is available for local pickup in Alexander City, Alabama. If you are interested in picking it up locally contact our customer service for a special pickup quote at 866-308-5484. This product can be returned within 30 days of receiving the product. Please note the details of our Return Policy. Dimensions: 45" x 31" x 7"